No more having to screenprint or contour-cut with vinyl cutter/plotters to get white lettering or graphics! No more having to screenprint or contour-cut with vinyl cutter/plotters to get white lettering or graphics! Print efficiently and easily with the new OKI Data proColor series C711WT laser fabric transfer printer. Using a combination of Cyan, Magenta, Yellow and White toners, this heat transfer paper printer can print a full spectrum of rich, high-definition colors – including more than you’re used to! 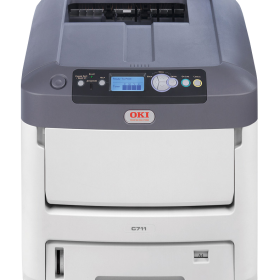 The OKI C711WT features a straight through media path to print up to 140lb weight media, transfer media up to 8.5″ x 14″, as well as a 530 sheet lower paper cassette to handle every-day printing. With easy to use printing drivers that allow you to control your printing details, the OKI proColor White Toner series offer heat transfer decorators a level of production and cost-efficiency that other processes just can’t match, on a large and short-run scale.